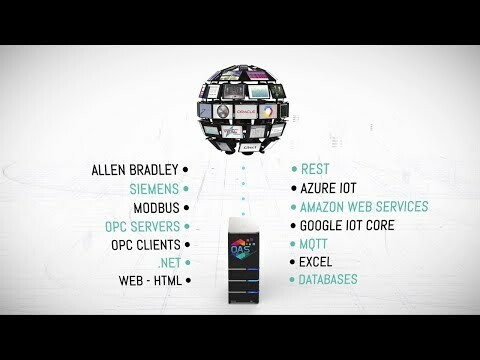 The Universal Data Connector is at the core of the OAS Platform allowing the movement of data from PLCs, IoT hubs, applications, databases and more. The Universal Data Connector is a server-based, highly-scalable, network platform that enables the transport and transformation of your data. Many other solutions lock your data in proprietary formats, thus limiting your ability to use or share your own data. The OAS platform is built upon a single principle, to liberate your data and allow you to move it through your enterprise with speed and flexibility. Once data sources are connected to the OAS Platform, data can be logged to infinite open databases for further analysis or storage. Each data point is monitored and can be transformed, or used to trigger alarms for real time notification. Additionally, all data passing through the Platform is made available to a site of developer tools and APIs for creating .NET, web, and native mobile visualizations. The Universal Data Connector is built upon a Distributed Network Architecture, enabling robust Edge Computing IIoT solutions. Learn more about the Networking Features of the OAS Platform. Perfectly suited to Big Data solutions, each OAS server can process up to 1,000,000 data points. Each can connect up to 10,000 servers to each client, and up to 10,000 clients per server. The result is throughput of up to 100,000,000,000,000,000 data points per network. Transfer data over your LAN, WAN, Intranet, or the Internet with 100 nanosecond resolution! When deployed on the network with each data source, the OAS Universal Data Connector captures and buffers data, so when external network connectivity is intermittent or unreliable, no data is lost. Data is transmitted as soon as communications is reestablished. OAS servers can also be configured for failover, to achieve necessary redundancy. Using the free Live Data Cloud feature, OAS servers can communicate with each other, relaying data without remote locations requiring a fixed IP address, allowing for data aggregation and remote monitoring. Service-to-service and service-to-client communications use WCF with encrypted and compressed packets for low network usage and high speed. Unlimited security Users and Groups can be configured as well, to control granular access to each data point and even each attribute of each point. Utilize programmatic setup of Tags, Driver Interfaces, Security Users and Groups, and more with .NET developer tools as well as through a REST API. This enables accelerated installations, and dramatically reduces the cost of multi-site deployments.